BOSTON – Today, joined by Lt. 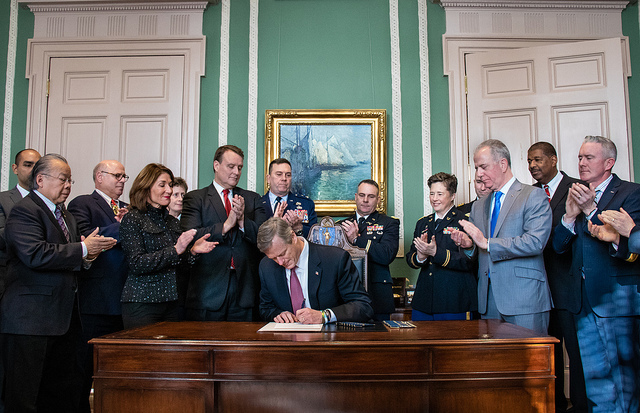 Governor Karyn Polito, Massachusetts National Guard Major General Gary Keefe, National Guard Command Staff and Representative Harold Naughton, Governor Charlie Baker participated in a ceremonial bill signing ceremony for An Act establishing the Massachusetts Code of Military Justice which modernizes and streamlines parts of the National Guard’s enabling statute, including the creation of a Uniform Code of Military Justice to be consistent with the American Bar Association’s ‘Model State Code of Military Justice and most other states, and an increase to the minimum daily pay for soldiers and airmen performing state active duty. The Baker-Polito first proposed the legislation in December 2017.